It’s not that I dislike Valentine’s Day. In fact, most years I’m all for it. We’ve done everything from going to dinner and a movie, to staying home and cooking up some incredible lobster risotto and steaks (man, that was a good year). This year though, things just kind of snuck up on me. With my husband working the night shift for the past 2 1/2 weeks, and time just tending to fly by now that I’m all old and things, I just kept telling myself that I had time to make some plans. Well, the day is upon us and the plans include leftovers. Total epic Valentine’s fail. I did manage to unsuccessfully sneak a couple of Valentine’s goodies for the kids at the store yesterday. I had the Baby with me and now that she’s three, not a lot slips past her. So now that I’ve bragged about all of my ninja-like gift buying moves, I do have something extra sweet to share. 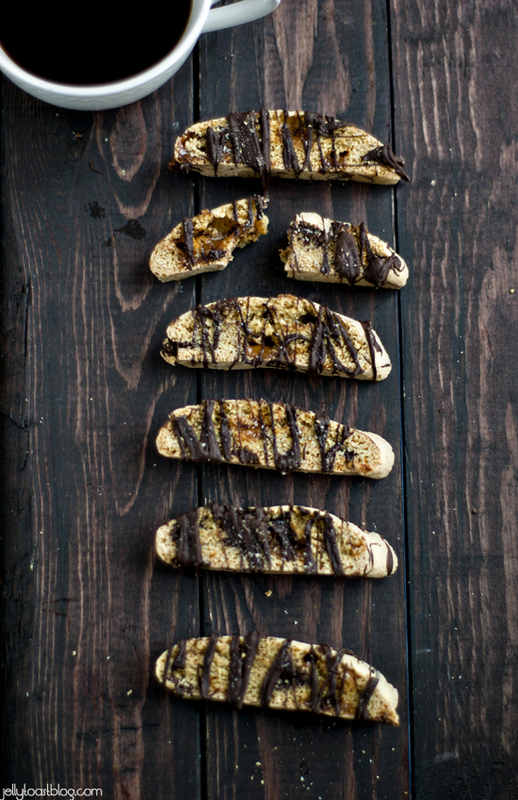 These Salted Caramel Chocolate Biscotti are everything a biscotti should be. 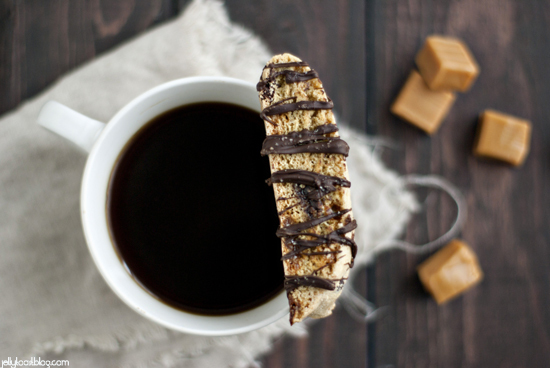 The amazing crunchy texture is perfect for dipping in a hot cup of coffee (or tea if you’d prefer) and the chewy, sweet caramel and bitter sweet chocolate are set off with a whisper of sea salt. Total and utter perfection. Just for the record, I did make two batches of these Salted Caramel Chocolate Biscotti simply to show my family how much I loved them. Also, we scarfed the first batch so fast that I didn’t get a chance to take a picture. I’m a true romantic through and through, I tell ya. I hope you have a wonderful Valentine’s Day! In the bowl of a stand mixer, beat together sugar, vanilla and eggs until white and creamy. In a separate bowl whisk together flours, baking soda and salt. With the mixer on low, slowing add dry ingredients to the wet ingredients. Mix until just incorporated. Fold in caramels and 1/3 cup of chocolate chips. Divide dough in half and form into two 12 inch logs on prepared baking sheet. Flatten slightly so logs are about 3/4 inch high. Bake for 35 minutes. Remove and allow to cool for 10 min. With a sharp knife, slice each log into 24 cookies. 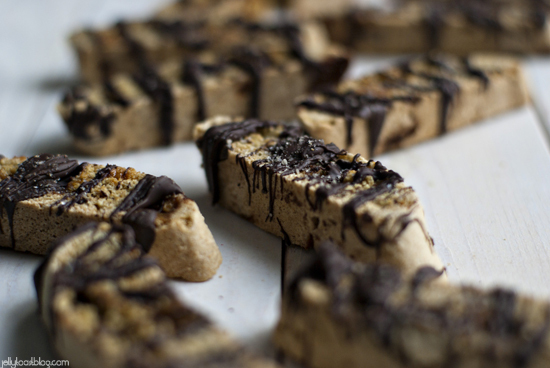 Lay biscotti down on the cut sides. Bake again for 10 minutes. 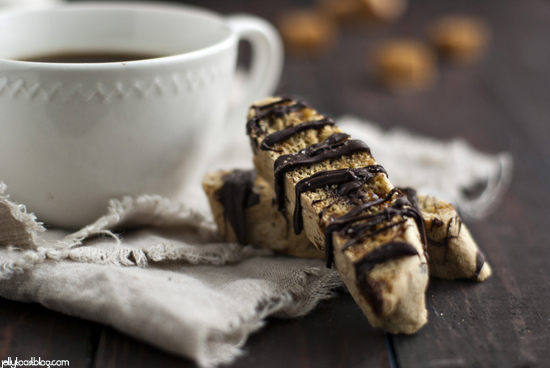 Flip the biscotti over and bake for an additional 10 minutes or until biscotti are nicely dried. In a microwave safe bowl, place remaining chocolate chips. Microwave on high for 30 seconds, stir and microwave again for 15 seconds. Repeat, microwaving for 15 second intervals until chocolate is completely melted. 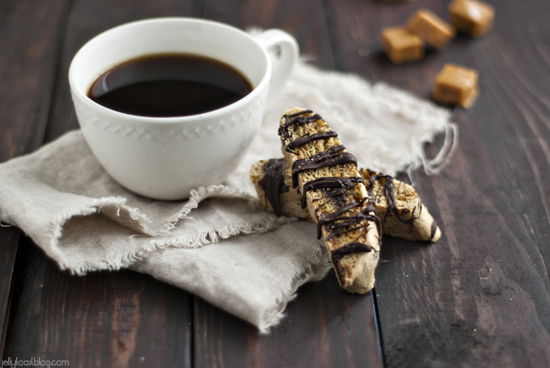 Use a fork or spoon to dip in the melted chocolate and drizzle over biscotti. Sprinkle with sea salt. Allow chocolate to set (these can be popped into the fridge to speed the chocolate hardening process along). 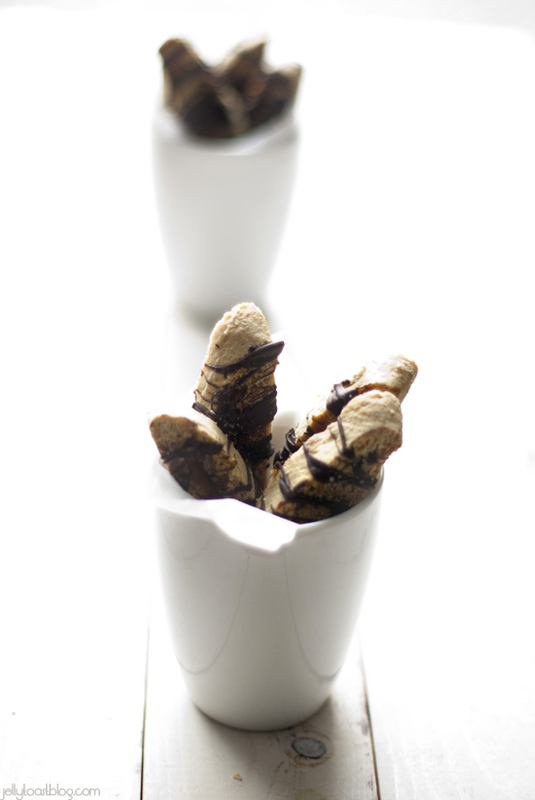 Biscotti can be stored in an airtight container at room temp for up to 5 days.